Fig. 1 Photon sieve. Tens of thousends of pinholes are arranged to diffract light or X-rays to a small focus. Fig. 2 Intensity distribution on the focal plane of a photon sieve compared to a zone plate. Smallest structure size for both optical elements is 30 nm. 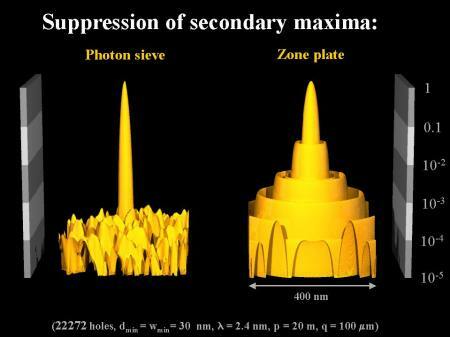 For the photon sieve, the suppression of the secondary maxima is evident. This provides sharper images. Fig. 3 Schematic of a nanospectroscope capable of recording high-resolution images revealing chemical composition, morphology, and the electronic properties of materials in the nanometer regime. Fourth-generation light sources based on free-electron lasers (FEL) will be capable of producing X-rays of such extreme brilliance that new ways of focusing the radiation will have to be found. A device reported on November 8, 2001 in Nature, based on the simple concept of an array of pinholes, could be the answer. The 'photon sieve' exploits the monochromaticity and coherence of light from a free-electron laser to focus soft X-rays with unprecedented sharpness. The combination of an excellent focus with extreme flux will provide new opportunities for high-resolution X-ray microscopy and spectroscopy in both the physical and life sciences. Light passing a circular pinhole produces a diffraction pattern of concentric rings of decreasing width with increasing radius. If light is passed through a mask made up of the same pattern of rings a focus is formed. These Fresnel zone plates are used to focus soft X-rays where conventional optics fail because of strong absorption of all materials in this spectral region. The ultimate resolution of a Fresnel zone plate is determined by the width of the outermost zone. The focal spot is surrounded by rings of intensity (secondary maxima) that blur the images obtained in X-ray microscopy and scanning spectroscopy. These limitations can be overcome by using a large number of appropriately distributed pinholes instead of rings as the diffracting elements. To obtain a distinct first-order focus, the pinholes have to be positioned such that the optical path length from the source via the center of the pinholes to the focal point is an integral number of wavelengths. The diameter of the pinholes is not limited by the width of the corresponding Fresnel zone. It can in fact be larger and yields a maximal contribution to the focus for a diameter of about 1.5 times the width of the zone. For larger pinholes up to about 2.4 times the ring width the contribution decreases but it still remains positive. This allows pinholes to be positioned on Fresnel zones that are narrower than the fabrication limit (20 - 40 nm) and the spatial resolution of the optical element could be better than 10 nm. Furthermore, with photon sieves, the unwanted ring-like secondary maxima generated by zone plates can be suppressed. For a zone plate each ring contributes equally to the amplitude in the focus. This contribution drops abruptly to zero beyond the outermost ring which leads to strong intensity oscillations in the diffraction pattern. With a photon sieve the number of pinholes per ring can be readily adjusted to yield a smooth transition which minimizes the secondary maxima. The development of fourth-generation synchrotron light sources that deliver coherent radiation in the soft X-ray regime in combination with photon sieves will provide a wealth of new opportunities in X-ray microscopy, spectroscopy and lithography. Photon sieves for use at the Hamburg Free-Electron Laser facility are currently being developed.